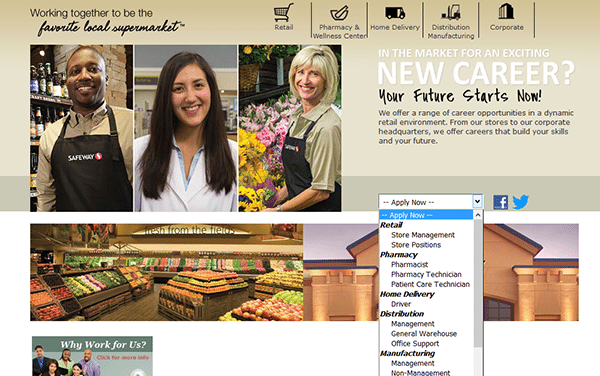 The Tom Thumb Food & Pharmacy job application can be accessed via the company’s careers page. 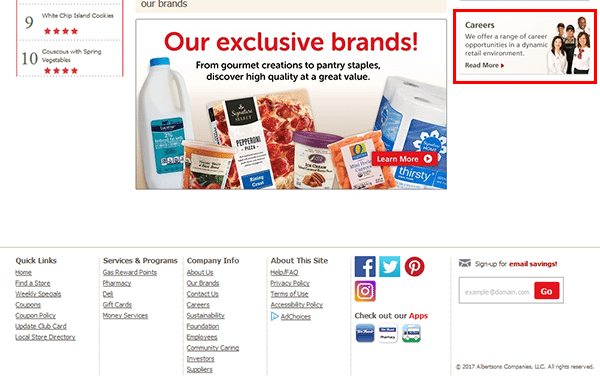 Follow the steps posted in the guide below to learn how to navigate the jobs page, search for current openings, and submit an application. Numerous types of jobs can be applied for including retail, management, corporate, and transportation positions. About the Company: Tom Thumb Food & Pharmacy is an American chain of supermarkets headquartered out of Roanoke, Texas. The company was founded in 1948 and currently operates more than 50 stores throughout Texas. Tom Thumb’s parent company is Albertsons. Step 1 – Click here to open the company’s homepage in a new browser window/tab. Step 2 – Scroll down the page and then press the link/button as outlined in red in the below screenshot. Step 3 – Select the type of career openings that you want to search for from the drop-down list (i.e. retail, pharmacy, distribution, corporate, etc.). Note: For examples purposes this guide details the application process for retail positions. Other career types may have different/separate application processes. Step 4 – Select your minimum age from the drop-down list and then click the “Continue” button. Step 5 – Enter a keyword (e.g. “Tom Thumb”), city, state, or zip code into the search fields. Press the “Search” button to load the results. Step 6 – The results can be refined by position or state/location. Click the link of the job that you’re interested in applying for to load the next step. Step 7 – Review the job description and then click the button as outlined in the below image. Step 10 – Create your security questions/answers and then click the “Submit” button to go to the next section. Step 11 – Submit the required information for each subsection of the online application form.